This is a museum quality reproduction of the first known aviation insignia for military uniforms. 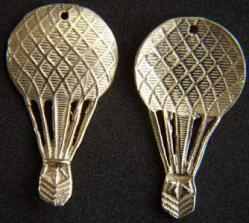 This is a set of two collar insignia worn by the Austrian-Hungarian members of their aviation section. They were sewn on to the uniforms using the hole on the top and through the wires holding the basket. This is the first collar that was used by anyone to designate aviation. A very rare item. Extremely rare is a match set. They are very thin making them very hard to make. These are made in sterling silver with a 24k gold plate.